Étienne François de Choiseul. 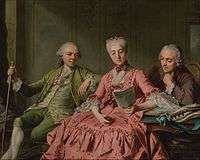 Painting by Charles van Loo. Étienne-François, comte de Stainville, duc de Choiseul (28 June 1719 – 8 May 1785) was a French military officer, diplomat and statesman. Between 1758 and 1761, and 1766 and 1770, he was Foreign Minister of France and had a strong influence on France's global strategy throughout the period. He is closely associated with France's defeat in the Seven Years War and subsequent efforts to rebuild French prestige. The eldest son of François Joseph de Choiseul, marquis de Stainville (1700–1770), Étienne François was born in Nancy in the Duchy of Lorraine where his father was one of the leading advisors to the Duke of Lorraine who ruled an independent French-speaking state with close cultural and political links with France. At birth, he bore the title of comte de Stainville. In 1737 Francis Stephen of Lorraine (the future Holy Roman Emperor Francis I) was pressured into giving up Lorraine and becoming ruler of Tuscany in Italy. Realising that continued loyalty to the House of Lorraine would limit his opportunities, Étienne François transferred his allegiance to France. After gaining experience during the Austro-Turkish War, the comte de Stainville entered the French army, and during the War of the Austrian Succession served in Bohemia (1741) and in Italy (1744), where he distinguished himself at the Battle of Coni. He was also present at the Battle of Dettingen in Germany and carried news of the French defeat there to Paris. He had been appalled by what he had witnessed of the French forces at Dettingen, particularly what he later described as their "indifference and ignorance", and his experiences motivated his later reforms of the French military. From 1745 to 1748, he was with the army in the Low Countries, and was present at the sieges of Mons, Charleroi and Maastricht. He attained the rank of lieutenant-general and, in 1750, married Louise Honorine Crozat, daughter of Louis François Crozat, marquis du Châtel (d. 1750), who brought her husband her share of the large fortune of her grandfather Antoine Crozat and proved a most devoted wife. Choiseul gained the favour of Madame de Pompadour by procuring for her letters which King Louis XV had written to his cousin's wife, Charlotte-Rosalie de Romanet, comtesse de Choiseul-Baupré, with whom the king had formerly had an intrigue; and after a short time as bailli of the Vosges he was given the appointment of ambassador to Rome in 1753, where he was entrusted with the negotiations concerning the disturbances called forth by the papal bull Unigenitus. He acquitted himself skillfully in this task, and, in 1757, his patroness obtained his transfer to Vienna, where he was instructed to cement the new alliance between France and Austria. He was one of the principal authors of the Second Treaty of Versailles, signed in May 1757, which pledged the two states to a combined war in Germany against Prussia. His success in Vienna opened the way to a larger career, when, in 1758, he supplanted Cardinal de Bernis as minister for foreign affairs, and so largely had the direction of French foreign and military policy during the Seven Years' War. In 1759, he planned an ambitious invasion of Britain which was halted by French naval defeats at the Battle of Lagos and the Battle of Quiberon Bay. His other major plan to achieve victory in 1759 was an attack on Hanover, which was thwarted by the French defeat at the Battle of Minden. Between 1759 and 1762, further French moves into Germany were unsuccessful – including the Battle of Vellinghausen. At this time, he was made a peer of France and created duc de Choiseul. Although, from 1761 until 1766, his cousin César Gabriel de Choiseul, duc de Praslin, was minister for foreign affairs, Choiseul continued to control the policy of France until 1770, and during this period held most of the other important offices of State. As author of the Pacte de Famille, he sought to retrieve by an alliance with the Spanish House of Bourbon the disastrous results of the alliance with Austria, but his action came too late. His vigorous policy in other departments of state was not, however, fruitless. Coming to power in the midst of the demoralization consequent upon the defeats of Rossbach and Krefeld, by boldness and energy he reformed and strengthened both army and navy, and, although too late to prevent the loss of Canada and India, he developed French colonies in the Antilles and San Domingo, His management of home affairs in general satisfied the philosophes. He allowed the Encyclopédie to be published, and brought about the banishment of the Jesuits and the temporary abolition of the order by Pope Clement XIV. In the years following the Treaty of Paris of 1763, Choiseul attempted to rebuild the French military. Alarmed by the British victory in the Seven Years War and the apparent hegemony that followed, he tried to secure continued Spanish support for a future war of revenge against Britain. In aid of this, he drew up a number of plans for an invasion of Britain. In an effort to compensate for French territorial losses, he added Corsica and Lorraine to the crown of France. He directed the French conquest of Corsica. He also oversaw a failed scheme to settle Guiana. By the late 1760s Choiseul was concerned by the growing strength of Russia around the Baltic Sea fearing that Britain was behind it. He believed they were planning a "northern league" against France. To counter this he hoped to depose or severely weaken the power of Catherine the Great by encouraging the Ottoman Empire to attack Russia. However, Choiseul's fall was caused by his action against the Jesuits, and by his support of their opponent La Chalotais, and of the provincial parlements. 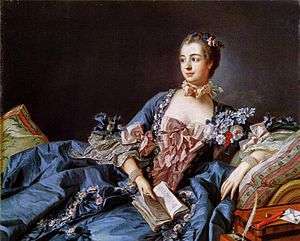 After the death of Madame de Pompadour in 1764, his enemies, led by Madame du Barry, the King's next mistress, and the chancellor Maupeou, were too strong for him. 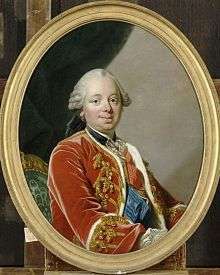 In an attempt to boost the Austrian alliance, Choiseul was an advocate of the marriage between the Dauphin, the future Louis XVI, and the archduchess Marie Antoinette, daughter of the Holy Roman Empress Maria Theresa and the Emperor Francis I. Choiseul considered the marriage a personal triumph and believed it would cement his position of power. In 1770, a dispute between Britain and Spain over the Falkland Islands threatened to flare into open warfare. As part of his long-term strategy to overturn what was seen as British hegemony, Choiseul was strongly supportive of Spain and he mobilised the French military in preparation for war. Louis XV, who sought peace after wars that had dominated much of his reign, was angry when he discovered this. At the height of the Falkland Crisis in 1770, Choiseul was dismissed and ordered to retire to his estate at Chanteloup. The crisis was then settled peacefully by Britain and Spain. Choiseul supported jews living in France. He was one of the people who influenced Louis XVI to allow judaism to be legally practiced. The intrigues against him had, however, increased his popularity, which was already great, and, during his retirement, which lasted until 1774, he lived in the greatest affluence and was visited by many eminent personages. He was succeeded as Chief Minister by Emmanuel-Armand de Richelieu, duc d'Aiguillon whose foreign policy was similar to that of Choiseul. D'Aiguillon favoured a more absolute monarchy than Choiseul did, and was strongly connected to the faction grouped around Madame Du Barry. Choiseul enjoyed widespread popularity and many people came to bid him farewell, as a gesture of support, as he prepared to leave Paris for his Chanteloup estate. Greatly to his disappointment, Louis XVI did not restore him to his former position, although the king allowed him to come back to Paris in 1774. Choiseul died in his private residence, the Hôtel Delaunay, in Paris on 8 May 1785, and was buried in Chanteloup. He left a huge accumulation of debts which was scrupulously discharged by his widow. Choiseul's widow, a woman "in whom industrious malice could not find an imperfection", lived in retirement until her death on 3 December 1801. Choiseul possessed both ability and diligence, and though lacking in tenacity, he showed foresight and liberality in his direction of affairs. In appearance he was a short, ill-featured man, with a ruddy countenance and a sturdy frame. His Mémoires were written during his exile in Chanteloup, and are merely detached notes upon different questions. English writer Horace Walpole, in his Memoirs, gives a vivid description of the duke's character, accuses him of having caused the Russo-Turkish War (1768–1774), as a revenge on tsarina Catherine II, and says of his foreign policy: "he would project and determine the ruin of a country, but could not meditate a little mischief or a narrow benefit. ... He dissipated the nation's wealth and his own; but did not repair the latter by plunder of the former". In reference to Choiseul's private life, Walpole asserts that "gallantry without delicacy was his constant pursuit". Choiseul Island, the largest island of the Solomon Islands is named after him. Choiseul Sound, a major inlet on East Falkland is named after him. Choiseul appears in the 1934 film Madame du Barry where he is played by Henry O'Neill. Choiseul appears in the 2006 film Marie Antoinette, directed by Sophia Coppola, where he is played by Jean-Christophe Bouvet. 1 2 3 4 5 6 7 8 9 10 11 12 13 14 Chisholm 1911, p. 261. 1 2 Chisholm 1911, p. 262. ↑ Chisholm 1911, pp. 261, 262. Black, Jeremy. From Louis XIV to Napoleon: the fate of a Great Power. UCL Press, 1999. Blaufarb, Rafe. The French Army, 1750–1820: careers, talent, merit. Manchester University Press, 2002. Murphy, Orville T. Charles Gravier, Comte de Vergennes: French Diplomacy in the Age of Revolution, 1719–1787. State University of New York Press, 1982. Leyer, Evelyne. Marie Antionette: The Last Queen of France. Portrait, 2006. Soltau, Roger H. The Duke de Choiseul. 1909. This article incorporates text from a publication now in the public domain: Chisholm, Hugh, ed. (1911). "Choiseul, Étienne François". Encyclopædia Britannica. 6 (11th ed.). Cambridge University Press. pp. 261, 262.